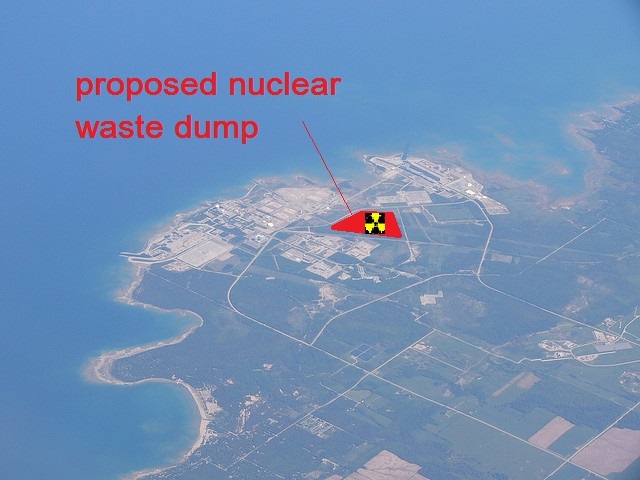 80 Groups Urge Canada: Reject Great Lakes Nuke Dump! CACC is proud to have signed this letter. We are dedicated to stopping nuclear power at every turn. The following was written by Kevin Kamps, Radioactive Waste Watchdog for Beyond Nuclear. Ottawa, Ontario, Canada and Washington, D.C. – Outlining the legal grounds for the Canadian federal Minister of Environment and Climate Change Catherine McKenna to reject Ontario Power Generation’s bid to bury radioactive wastes right beside Lake Huron, 80 public interest groups from Canada and the US have issued a joint letter as pressure mounts on McKenna to make the right call. McKenna is due to issue her decision on or before March 1, 2016. Thanking McKenna for responding positively to the joint letter sent by NuclearWaste Watch in November by extending the timeline for issuing a decision statement on Ontario Power Generation’s proposal to bury up to half a million cubic metres of radioactive wastes beside Lake Huron, the February 8th correspondence restates that the Joint Review Panel (JRP) recommendation that Ontario Power Generation’s proposed Deep Geologic Repository for Low and Intermediate Level Radioactive Wastes be allowed to move to licensing was in error, and sets out several examples of how Ontario Power Generation failed to meet the requirements of the Canadian Environmental Assessment Act (CEAA 2012), the Environmental Impact Statement (EIS) Guidelines, and the JRP Agreement, which are the three legal requirements. Ontario Power Generation’s proposal was to bury 200,000 cubic metres of low and intermediate level radioactive wastes produced during reactor operations deep underground in a series of underground caverns carved out of limestone. Weeks before the federal hearing began in September 2013, OPG publicly acknowledged its intention to double that amount by adding decommissioning wastes – including radioactive reactor components and contaminated building materials and rubble – through a license amendment after approval based on the initial proposal has been issued. The proposal faces large and growing public opposition. 184 municipalitiesrepresenting more than 22 million people have passed resolutions opposing OPG’sproposed waste repository. On November 5, 2015, a bipartisan group of six U.S. Senators and 26 U.S. Representatives from a number of Great Lakes states wrote to Prime Minister Trudeau urging him to block the deep geological repository. “Momentum continues to build against this burial scheme,” said Kevin Kamps, a radioactive waste specialist with Takoma Park, Maryland, U.S.A.-based organization Beyond Nuclear, a national and international watchdog on the nuclear power industry. “McKenna made a good call in November, extending the deadline for the decision statement on the Joint Panel Report, which allowed her and her staff more time to get to know this file,” commented Brennain Lloyd, a spokesperson with Northwatch. Brown’s gas and other nuclear waste remediation and elimination technologies need to be used to stop this nonsense. The laws forbidding remediation need to be nullified immediately.